Isn’t Medex Courier Service strictly for medical delivery? Absolutely not! Medex began as a medical courier operation, however it expanded to a full service courier many years ago. We provide courier service to both residential and commercial locations. I don’t have an account with you, can I still use your service? Of course you can! Just make sure to request service in time for us to arrange for pick-up and delivery. Use our calendar to view delivery days. We accept Visa and Mastercard over the telephone for payment. What are your hours for delivery? Our delivery hours are 8am to 5pm Monday through Friday and after hours by request. What are your hours for same day delivery? 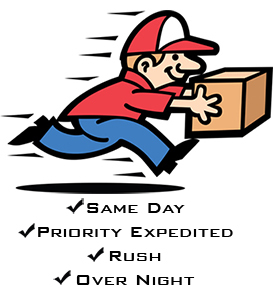 Same day delivery service is available from 8am to 4pm Monday through Friday. After hours is also available by request. I have a shipment that is not very heavy but is bulky, how do you charge for that? All packages are measured by cubic weight. L x W x D ÷ 1728 x 15 = Cubic Weight. What happens to my package if the person receiving it is not available? If the destination for your delivery is closed we will deliver it the next day or we will make a second attempt by request on the same day. I have an urgent delivery; can you send the driver right away while I finish putting it together? If you request service and your packages is not ready for delivery we will wait 15 minutes at no cost to you. There will be a charge of $25.00 per hour (.41 cents per minute) for waits beyond 15 minutes. I think I gave you the wrong address – what happens? If your package is sent to the wrong address there will be a $5.00 charge plus a re-direct charge for delivery to the new location or a return to the sender. Insurance is available at an additional cost. The fee is $5.00 per $100.00 of the value declared. Do you accept hazardous goods for delivery? No, we do not deliver hazardous materials. How do I receive proof of delivery? When your package is successfully delivered the delivery details are captured digitally via the receiver’s signature. A copy can be sent to you by special request. Does Medex provide shipping materials? We have tyvec envelopes available by request. How do you ensure security of sensitive documents or materials? Each of our drivers are fully trained and highly experienced. We only hire the most reliable and courteous delivery personnel. Have you filled out a Medex credit application? If "No" you can find our credit application HERE. You can find descriptions of our delivery options and delivery days HERE.